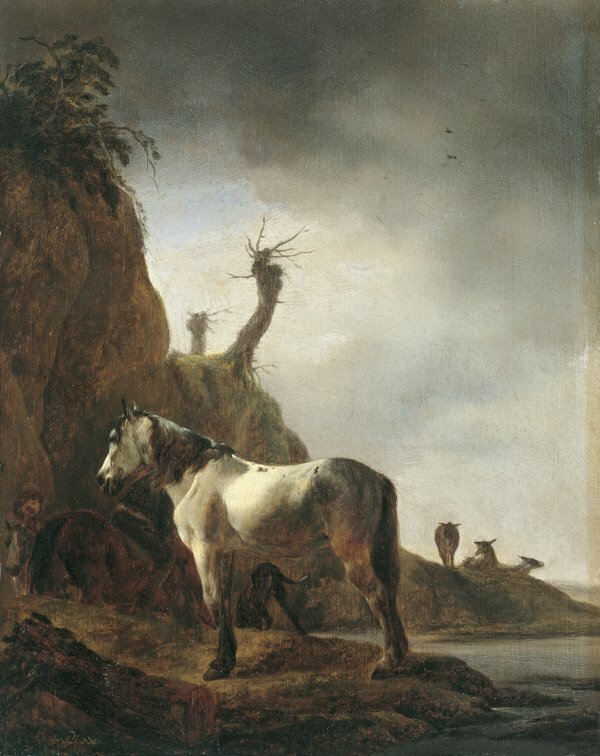 Philips Wouwerman specialised in scenes with horses and riders set against landscape backgrounds, although he also painted religious and mythological compositions. His equestrian subjects with horses and riders setting out for the hunt, troops on horseback, highwaymen and bandits were extremely popular in his own time and later. Wouwerman worked throughout his career in Haarlem where he is regularly documented with only a few short periods of absence. According to Cornelis de Bie, Wouwerman trained with Frans Hals but his works do not indicate any influence of that artist. Around the end of the 1630s he moved to Hamburg to the studio of the history painter Evert Decker. In 1640 he is again recorded in Haarlem where his name is registered in the painters’ guild that year. Ebbinge-Wubben considered White Horse on a River Bankto be an early work by the artist and one that reveals the influence of Pieter Verbeecq, another artist who specialised in works of this type and who may have inspired not only the subject of this painting but also its palette of earth tones. Early works by Wouwerman tend to include a limited number of animals located in settings with dunes based on the outskirts of Haarlem. They use a low viewpoint appropriate to the vertical formats of the compositions. As Ebbinge-Wubben noted, the present panel is signed with the painter’s initials, a practice that Wouwerman continued to use until around 1646, at which point he signed his works with the first letters of his name next to the first letter of his surname. The present panel depicts a white horse as its principal motif, seen from the side and using a low viewpoint. The setting is a simple one consisting of the steep face of a rocky outcrop to the right of which are three donkeys behind an area of water. The quality of the brushstroke is evident in the manner of reproducing the texture of the horse’s coat and mane and its expressive head. Gaskell compared this panel with another by Pieter Verbeecq entitled Two Riders on a Path in the Mauritshuis, The Hague, in which that artist used a series of elements seen in this panel by Wouwerman. The provenance of the present work is known since 1778 when it was auctioned in Amsterdam. It was subsequently in various collections in Paris in the 18th and part of the 19th centuries. Around 1952 the panel was in Amsterdam in the collection of Dr Hans A. Wetzlar and was acquired for the Thyssen-Bornemisza collection in 1956.